Manwaring Moments: Kittens, Free Kittens! So.....I still need to blog about our last trip to Yellowstone and all the adventures that entailed, but really quick before I do that, I have to put this little story in. Alyssa's friend's older sister, REALLY wants a pet. This little girl has even gone to the extremes of presenting power point presentations all about what animals make good pets. Her parents are not pet people. Last week she found an add on Craigslist for some kittens. Then on Friday, she somehow talked her friend's mom (and why that mom agreed is a mystery to me) into driving her out to some farm in a neighboring city to get a kitten. She ended up coming home with FIVE kitties. She then (and this is my favorite part) HID the cats in the basement hoping Mom and Dad wouldn't find out. She and the siblings kept it secret for 3 days before they were discovered. (Oh man....I laugh every time I think about that.) Well, of course when the parents learned about they were upset and told the kids they had until lunch time to find the cats homes or else they were going to take them to the animal shelter. They called everyone they knew (including my kids) asking if they wanted a kitten. Of course when my kids heard about it, they were just as concerned about finding homes for the kitties as the friends were. 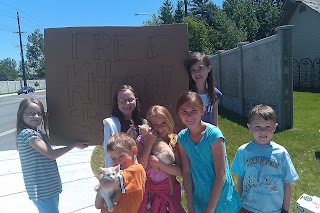 They eventually set up on a busy street corner screaming at every passing car, "Kittens! Free Kittens!" With my kids yelling just as loud. Oh my....it was SO funny! They did end up finding homes for 3 of the 5 in the 3 short hours they had. Which I think, is pretty successful. This is going to be one of those stories that their family will tell for years, "Remember when we hid 5 cats in the basement?" LOL! Ha ha! I recognize those kiddos! Was it Lauren that wanted the kitten?? That is TOO FUNNY! Can't wait to hear about Yellowstone. It's on my list for NEXT summer, so do tell all! I did something similar... and I was 15 at the time, LOL!